Along the Road to Hana, Maui, Hawaii. (C) Nefer Khepri, 2014. I had another dream about the Virgin Mary last night. I don’t remember if She said anything to me. She was facing me, dressed in an iridescent blue robe and white gown. She was wringing her hands & had tears of blood all along her face. They were coming down & the blood was beginning to saturate the neckline of her robe. Although She didn’t say a word (that I can remember) I’m sure that dream is tied to the Ebola problem. If you remember, I dreamt about her a couple of weeks ago and She asked us all to pray & to pray often & hard, with emotion. You can read that blog post here if you missed it. As a result of this new dream, combined with the first dream, and the current state of world affairs, I cannot help but think both are tied to the Ebola situation. Doctors and missionaries who have become infected with the virus are being shipped to their home countries for treatment. Those home countries (at least in Dallas, Texas) are not properly equipped to deal with Ebola so others have become infected. Already there has been a nurse infected in Spain who was treating a missionary and a nurse here in Texas (Dallas) who treated the man from Liberia who passed away last week. Consequently, I have created a public event on Facebook asking everyone, no matter what your walk of faith may be, to please pray, send energy using any healing modality you know of, and light candles holding the intentions I have outlined below. I invite everyone to join the event on Facebook and I ask you to please share this blog post so others can also join in our efforts. The event is set for Saturday, but any time this weekend will be just wonderful. protective energy to all nations in order to prevent the worldwide spread of Ebola. I truly believe if we make a concerted effort & we all focus on these main points every time we pray, send energy, or light a candle, that we can make a real difference. Prayer to Our Lady, Undoer of Knots. Photo (C) Nefer Khepri, 2014. My Facebook friend, Sally Nur, posted this prayer to her timeline this morning. It was one of the first things I read when checking my account. It is VERY powerful. Just reading it made my intestines feel like they were shaking! 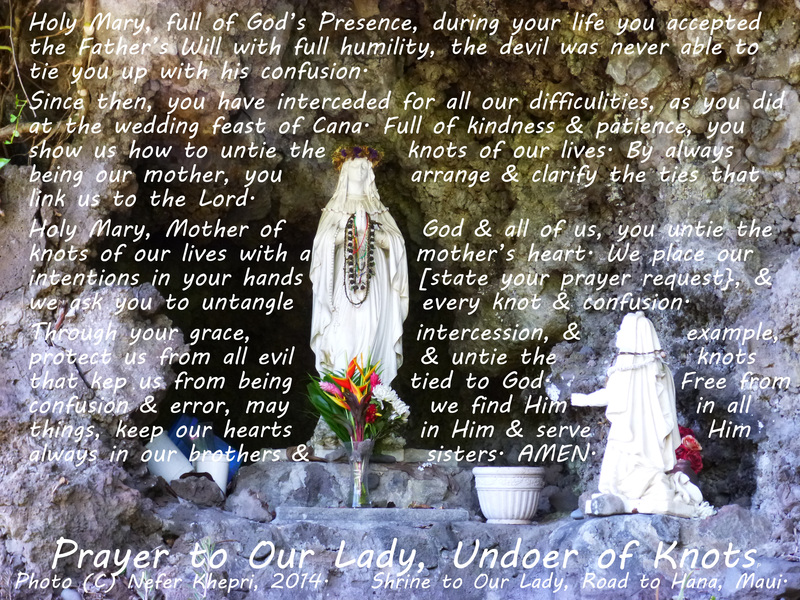 I am sharing it here in the form of a meme I created using a photo I took of a small shrine to Our Lady that was set into the cliff wall somewhere along the Road to Hana, Maui, Hawaii. This is a little shrine, about 2 feet long, that is set into a hole in the cliff wall along the Road to Hana. You can only view it going TO Hana. If you’re coming back then you have the opposite lane of traffic between you and the shrine. The twisty, narrow 2-lane road doesn’t allow you to look around well so coming back from Hana everyone would definitely miss it. My husband and I made the drive to Hana twice before & we never saw the shrine until our third trip this past June. I don’t know if the shrine is brand new or if it’s been there all along. I’m so glad we found it this time. My husband actually saw it first and backed up the car so I could take this picture. We risked being rear-ended on a curve along the cliff road that had about a 1,000 foot drop so I’m very glad I got this picture in one take! I invite everyone to use this prayer if you so desire & to join us in our global effort to find a cure for Ebola. Already too many lives have been lost. Previous Free Tarot Reading for the Week of October 10th.